I am so in love with this wedding because simply put, there is so much to be in love with. There’s the creativity of this awesome couple in turning a working family farm into a beautiful space for a wedding. Their amazing DIY creations and made-with-love decor is simply divine, as was their stunning personalised ceremony, pulled together and crafted by an incredible wedding celebrant. And sorry, but any wedding that features a gorgeous doggie, is a top one in my books! Gorgeous couple Emma and Alex have such a wonderful love story, too. From how they met (newly arrived to the UK, New Zealander Alex was sleeping on his cousin’s sofa who house-shared with one of Emma’s best friends), how they got engaged (Alex popped the question whilst on a three month visit to the New Zealand, at East Cape lighthouse where he proposed at sunset, on one knee, with his grandmother’s engagement ring, aw!) And of course, how they tied the knot in such an amazing, personal ceremony, which we’re going to delve into right now. I’m going to hand over to Emma to share with us the beautiful details of their awesome celebration of love, along with the fab images from photographer John Thompson. Having looked at a few venues and talked it through with some friends we had the idea that as my dad has a farm we could have a marquee and then we thought why waste the money on a big tent when we have some barns! It really was all hands on deck (or farm yard) for many months before to get it cleaned up. The barns were full of grain, straw and machinery and all needed a good clean. Alex and I spent a whole day (or two) in the bucket of a JCB jet washing the ceiling and walls! Removing any cobwebs and cow poop! We used one barn for the ceremony and one barn for our dinner and party. It just seemed right being a farmer’s daughter to have it on our farm, where I grew up and helped out. Alex had also grown up on a farm in New Zealand, too! My Dad, right up until the day itself, thought we were absolutely bonkers. We knew it would be hard work but we both had the vision to make it happen. But all credit to him for all his hard work and willingness to let us take over the farm! We just wanted something simple and personal, with all our friends and family there to support us and have a good old knees-up after. We wanted it to be relaxed and fun for us and our guests. I wanted it to be rustic too, to reflect the countryside setting, relaxed and natural and not overly pretentious. To help with the relaxed mood, we had a signature cocktail called named East Cape Sunrise served in jam jars, before the ceremony. We thought this would be nice for people who had travelled far and/or had stressful journey getting there! It gave people a chance to chat that hadn’t seen each other for a while and those that had been to the stag and hen parties to re-connect. A religious ceremony didn’t seem appropriate for us. Neither of us go to church regularly so it seemed wrong and disingenuous to have a religious union. We wanted the ceremony to be relaxed and we wanted our guests to feel relaxed too. It was also important for us that the ceremony, although very personalised, kept with fairly traditional wording. We also asked our friends to do readings and sing. We are both very much into music and music has been a feature throughout our relationship. Going to festivals and gigs has very much been a part of our life together so far. So we wanted to weave this in to the ceremony. We had one friend sing Ellie Goulding’s,’How Long Will I Love You,’ with our best man accompanying on guitar, whilst we signed the wedding certificate. Another friend read the lyrics to Metallica’s Nothing Else Matters and another read Thank You by Led Zeppellin. Little drops of rain whisper on the pain, tears of loves lost in the days gone by. An inspiration is what you are to me, an inspiration. Katie our celebrant, also beautifully weaved in the story of how we met and also spoke about how much family and family bonds mean to the both of us. My faithful partner and my one true love. to love you truly through good times and bad. Our ceremony was the most important part of our wedding; to say vows in the presence of our friends and family in a venue that meant so much to both of us, gives us such a feeling of pride and happiness. Katie, our celebrant was brilliant. We couldn’t have asked for any more from her. She listened to everything we had to say and somehow formed the most perfect ceremony. She was able to tell our story very succinctly. We didn’t have a strong idea of what we wanted the ceremony to be like and apart from church weddings we hadn’t been to a celebrant-led wedding before, so had no idea what form the ceremony would take. Katie made the ceremony so very personal for us and it was as if she had known us for years. She executed it very professionally and we were so pleased we found her! We feel very grateful to have such supportive family and friends that helped us create such a special day. I think by their involvement too it made it special for everyone. John Thompson for the fab images. 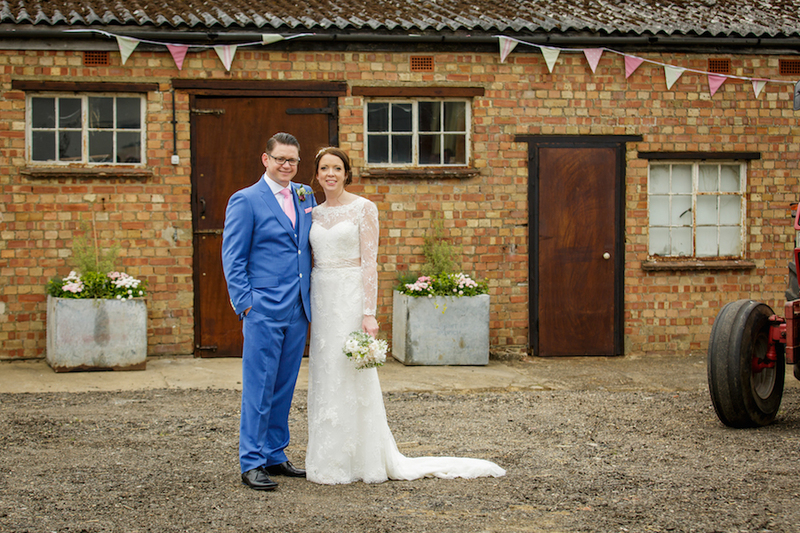 And the awesome Alex and Emma who were so enthusiastic in sharing their fantastic wedding celebrations. I don’t know who wouldn’t be inspired by these two to really go for it and create the day of your dreams, even when it’s through lots of hard work and determination! Thank you guys, so much!